The Congress today pulled up party spokesperson Rashid Alvi for his remarks about Samajwadi Party leader Mulayam Singh Yadav and forced him to retract his statement. Despite the Congress officially distancing itself from Rashid Alvi’s statement describing Samajwadi Party patriarch Mulayam Singh Yadav as a BJP agent, an uneasy calm is visible in the SP camp. In a significant move, India and China will have a high-level group to address their fast-growing, and, at times, overlapping ambitions at sea. With Purno A Sangma leaving the Nationalist Congress Party (NCP), the party has lost its only leader with a nationally known face from the northeast. The NCP was formed in 1999. It was Sangma who had taken the lead in formation of the NCP units in all the northeastern states while he managed to set up a formidable force for the party in his home state Meghalaya, especially in Garo Hills areas. The US is not ready to give stealth technology in Black Hawk in case India makes up its mind to buy the famous gunship. Food Minister KV Thomas today announced a slew of measures to tackle the problem of plenty before the country, including teaming up with Rural Development Minister Jairam Ramesh for building storage capacity under MNREGA, increased utilisation of existing storage space, evacuation plans for vulnerable stocks and additional allocation under the Public Distribution System (PDS) and Open Market Sale Scheme (OMSS). Pakistan's High Commissioner-designate Salman Bashir has arrived in India to take charge of his new assignment, ahead of the foreign secretary-level talks between the two countries in early July. Santosh Kumar Singh (32), who had been declared dead by the Uttar Pradesh Government in 2003, filed his nomination today for the Presidential election. Rajasthan DGP Harish Meena today announced a cash reward of Rs 50,000 for information leading to the arrest of Kailash Jakhar, an accused in Bhanwari Devi abduction and murder case. Rashid Alvi had described Mulayam Singh Yadav as a "BJP agent" while addressing a rally in Moradabad yesterday. Alvi had said that he had been observing Mulayam Singh Yadav for the past 10 years. "People may or may not like what I have to say, but I would still say that he is a BJP agent. He dances to the tunes of the BJP," he said. Going into damage-control mode, AICC general secretary Janardan Dwivedi, who is learnt to have called up Alvi to censure him, slammed the spokesperson and said the party did not approve of his remarks. "We are always in favour of uniting secular forces. We do not approve of Alvi's comments," he said. Subsequently, Alvi told television channels that he was retracting his statement, adding that the views expressed by him were personal and did not reflect the party position.The Congress had reason to be perturbed over Alvi's comments as it would not like to upset the Samajwadi Party at this stage when it needs its support in next month's presidential election. In fact, the party leadership had gone out of its way to woo the SP leader and wean him away from the Trinamool Congress chief Mamata Banerjee when they recently joined hands in rejecting the UPA presidential candidates. People may or may not like what I have to say, but I would still say that he is a BJP agent. He dances to the tunes of the BJP. We are always in favour of uniting secular forces. We do not approve of Alvi's comments. A delicate equation has developed between the Congress and the Samajwadi Party after Mulayam took a U-turn parting ways with Trinamool Congress chief Mamata Bannerjee and sided with the Congress in garnering support for its presidential candidate Pranab Mukherjee. That equation appears to be under threat after Alvi’s statement. Party spokesperson Rajendra Chaudhury described Alvi’s statement as shameless and irresponsible. “Ignorant people like Alvi do not know that if secular Mulayam Singh Yadav had not launched an offensive against the BJP, the UPA government would not have come to power at the Centre. Again it was the Samajwadi Party president who bailed out the Congress-led UPA over the nuclear deal,” he added. Rajya Sabha MP Ramgopal Yadav advised Alvi to get himself examined either at the asylum at Agra or Ranchi. Despite a Congress party clarification describing Alvi’s statement as his personal views and Alvi later admitting that his statement was not the Congress’ official stand, SP MP Shahid Siddiqui demanded a public apology from Alvi. He also wanted to know if Alvi had consulted Congress president Sonia Gandhi before making the statement. Ignorant people like Alvi do not know that if Mulayam Singh Yadav had not launched an offensive against the BJP, the UPA government would not have come to power at the Centre. The two countries will look at common interests of providing security at sea for merchant shipping. Crude oil is carried on ships and billions of dollars of trade is done through the route. Protection of the Sea Lanes of Communication (SLOCS) - a designated international sea trade corridor - is one area where cooperation is a must for both countries heavily dependent on sea trade to run their economies, sources said. New Delhi will set up an inter-ministerial group on its side while Beijing would have an official team that would periodically exchange views with each other on “maritime trade and security”. The Indian group is expected to have the Ministry of External Affairs, Ministry of Defence, Ministry of Shipping and the Department of Oceanography. In Brazil today, Prime Minister Manmohan Singh and Chinese counterpart Wen Jiabao met on the sidelines of Rio+20 Summit, where they agreed to step up defence and security dialogue. The maritime cooperation is an important part of that. Earlier in March, just ahead of the BRICS summit, it was announced that a maritime cooperation interaction will be finalised between the two Asian giants who aspire to have a “blue-water’ navy and project themselves as dominant players at sea. Naval warships of China and India, are in common grouping with Japan - South Korea will join on July 1 -- in anti-piracy patrols in the pirate-infested waters in the Gulf of Aden which, when traversed westwards, leads to the Red Sea and the Suez Canal. New Delhi is also keen to have a Naval ‘protocol at sea’ with Beijing. The US and the USSR had such an agreement during the Cold war era. This prevented misunderstandings from escalating into skirmishes. India perceives that a misunderstanding could occur with China as warships of both Navies, nowadays, traverse the oceans on different duties like anti-piracy operations and long-range deployments. Last year Indian naval warships had separate face-offs on high seas in international waters with Pakistan Navy and Chinese Navy. On both occasion, it led to a war of words and a blame game between the two countries. Indian warship INS Godavari had a brush with Pakistani ship PNS Babur in the Arabian Sea earlier this year. Babur had rammed into Godavari damaging its flight deck net. After that, INS Airavat sailing in the South China Sea was asked over open radio by a person identifying the area as Chinese territory to back off. The Indian warship continued on its course. New Delhi will set up an inter-ministerial group while Beijing would have an official team that would periodically exchange views with each other on "maritime trade and security". Today the NCP has the strongest presence in Meghalaya with 14 MLAs (till Sangma resigned yesterday for the party) in a House of 60 while it has five MLAs in Arunachal Pradesh and a lone MLA in Manipur. All the NCP legislators in Meghalaya are staunch supporters of Sangma while party workers and leaders across the region look up to only him as their leader as other NCP leaders hardly visit the region or keep contacts with party rank and file. Sangma’s son Conrad Sangma is the leader of the Opposition in Meghalaya Assembly. With Assembly poll due to be held in Meghalaya by March next, it remains to be seen what strategy Sangmas adopt as it is only expected that most of the incumbent NCP leaders and cadres will side with them. The Americans arranged a highly classified presentation on Black Hawk for top officials of the Ministry of Defence on June 20. The Tribune on June 19 broke the story about the Black Hawk presentation. Sources said the presentation was not done by private sector Sikorsky Aircraft Corporation that manufactures Black Hawk. The briefing was arranged through US diplomatic channels. This kind of protocol is followed in case of those defence and nuclear products that comprise sensitive and classified technology and require Washington’s clearance, even if these are manufactured by private sector firms. Sources close to the US diplomatic mission claimed “neither Indians asked to be briefed about the stealth technology in Black Hawk, nor we are offering it in case New Delhi opts for this rugged helicopter in future”. This was the first Black Hawk presentation to India by the Americans, who feel that this flying machine can be suitable to both the IAF and the Army for desert and high-altitude operations. The briefing was not linked to any defence deal under consideration. 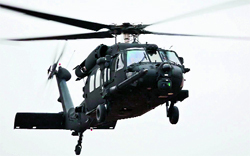 Despite strong military ties with Pakistan, the US has not sold Black Hawks to Islamabad. Currently, India is evaluating Black Hawk’s naval version “Seahawk” S-70B, which is in race for the Navy’s over $ 1-billion deal for 16 multirole helicopters. Seahawk rival is NH90 helicopter, a product of the NATO Helicopter Industries - a European consortium of France, German, Italy, Spain, Finland and Australia firms. A spokesman of Sikorsky, which manufactures both Black Hawk and Seahawk, told this correspondent that “Black Hawk is not the world’s most expensive helicopter.” He claimed “Black Hawk is one of the affordable, highly versatile and proven helicopters”. This helicopter is playing an active role in Afghanistan and Pakistan in counter-terrorism operations. In May 2011, Black Hawks hit headlines world over when the US Navy SEAL commandos in two such helicopters carried out a successful mission to kill the world’s “most wanted man” - Al-Qaida chief Osama bin Laden - in Abbottabad, near Islamabad. During the surprise operation, one Black Hawk helicopter, while hovering over the sprawling complex where Laden was hiding, had crashed. The exact cause of its fall is still not known. The SEALs had burnt the crashed machine as it was made of highly classified technology. They carried Laden’s body and the crashed chopper’s soldiers in another helicopter. However, the export of wheat does not - so far - appear to be an option before the Centre, battling with 66.17 lakh tonnes (LT) of wheat under the ‘kutcha’ storage largely in Punjab, Haryana, Madhya Pradesh and Rajasthan. “We are not against export, but there are huge amounts of subsidies involved (in grain procurement),” Thomas told The Tribune on the sidelines of a conference called to unveil the plan of action to deal with overflowing granaries - 823.17 lakh tonnes in the Central pool foodgrain stocks (501.69 LT wheat and 321.48 LT rice). Regarding Punjab’s clamour for exporting excess wheat stock, all that Thomas said was, “Let them (Punjab) send a proposal. We are already allowing exports under the Open General Licence (OGL)”. Sources said that the Food Ministry has decided to let the Cabinet Committee on Economic Affairs (CCEA) take a call on wheat exports as offering subsidy on exports from government reserves was a big issue involving funds and required consensus among all concerned. The recent decisions by Empowered Group of Ministers (EGoM) on increasing allocations for BPL and APL families and a more liberalised OMSS have already evoked speculations about additional subsidy burden. A career diplomat, Bashir was until recently the Foreign Secretary of Pakistan and had played a critical role in putting the dialogue process between India and Pakistan back on the track after a hiatus of more than two years in the wake of the Mumbai terror attack. He is expected to present his credentials to the President soon, official sources said, suggesting that the event would take place before the foreign secretary level talks. The 60-year-old Bashir was Pakistan’s Foreign Secretary for almost four years, from April 2008 to March 2012. He also served as Pakistan's envoy to Denmark, Lithuania, China and Mongolia. He did a stint at Pakistan's Mission to the United Nations in Geneva. During his stint in China, he had developed a close rapport with the then Indian Ambassador Nirupama Rao. That did help both of them in resuming the dialogue process in February 2011 when they were Foreign Secretaries of their respective countries. However, his controversial remarks in February 2010 describing the Indian government’s dossier on JuD chief Hafiz Saeed as a "piece of literature", did attract the wrath of New Delhi. Thereafter, he was quite cautious and restraint in any interaction with the media on India-Pakistan relations. Santosh, who hails from Chhitauni village in Varanasi district, Uttar Pradesh, has filed his papers just to bring on record the fact that he is alive. He has been fighting a case in the Varanasi district court since 2003 to prove that very fact. “The official record of me filing the nomination will help me win the case,” he said. In 2000, actor Nana Patekar had come to the village to shoot a film. Impressed with Santosh’s culinary skills, the actor took him to Mumbai as a cook. As his parents and brother had died, he got married to a Scheduled Caste woman, Supriya, in Mumbai. On Santosh’s return to his native village in 2003, his uncle and other persons of his caste in the village ganged up against him on knowing about the caste of his wife. They encroached upon his property, beat him up and got it registered in the record of the district administration that Santosh Kumar Singh had died. When Santosh met the district administration officials, they also allegedly threatened to get him beaten up and asked him to leave the village. 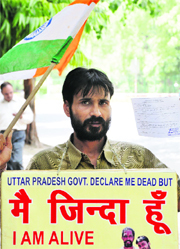 Santosh Kumar Singh filed a case in the district court but he lost as he could not pay his lawyer. His wife filed a case of discrimination with the Scheduled Caste Commission in Mumbai where the concerned officials of the Uttar Pradesh Government were summoned for discussion. Santosh has been sitting on dharna at the Jantar Mantar in Delhi since January 9 demanding rectification of the record with the UP government. He approached the Parliament Police Station in New Delhi to register a case against his uncle and other villagers but the police here expressed helplessness as the incident had occurred in Varanasi and not in Delhi. Jakhar had on June 14 escaped from police custody from a Jodhpur court premises where he was taken from jail for trial in some other case. Several police teams had raided many places in search of him but failed to trace him. Jakhar, a resident of Jaloda village in Jodhpur, is an accused in 42 cases lodged with different police stations.